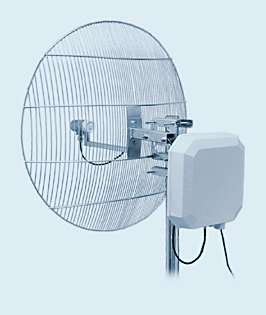 The Outdoor Unit MAG-5G is a wireless device for outdoor mounting next to an external antenna, operating in the 5,2 to 5,8 GHz band. It can be used at access points and at client locations. Typical uses are to power access point antennas, make backbones between access points, or to connect customers to the network. Signal and power are supplied conveniently through Ethernet cable using included Power-Over-Ethernet power supply. Configuring this device is very easy by web browser (Internet Explorer 5.5 or higher) or by telnet. It uses a TCP/IP protocol base. The radio components work in the 5,2 to 5,8 GHz and 2,4 GHz band, and are compatible with the IEEE 802.11a standard. Supported operating modes are AP, AP Client, or Bridge. Outdoor Unit MAG-5G (PDF 83KB).